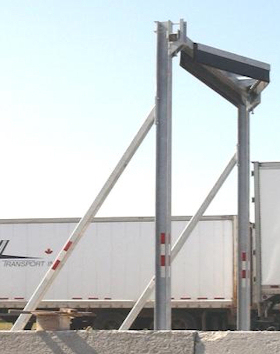 Every winter, the trucking industry in northern climates is faced with many problems caused by snowfall. The use of our "SRS200-S Avalanche" system can be beneficial in many ways. Employee Safety - Employee's will no longer be required to climb atop their trailers to manually remove snow. Thereby improving safety and possibly reducing "Workers Compensation" rates. Time Savings - Effectively clearing the snow from the tops of your trailers in only a fraction of the time currently required. Fuel Economy - Cleaner trailer roofs, create less drag therefore fuel consumption should be reduced. Weight Savings - A roof covered in snow adds weight to the trailer. This added weight results in not only increased fuel demands but in reduced payload capacity as well. Road Safety - Reduced risk of injury to motorists, following your tractor-trailers along the roadways. This reduced risk will lead to fewer insurance claims, which may in turn lead to lower rates. Through the use of our "SRS200-S Avalanche" system you will find that all of these concerns will be addressed. This durable system has been designed to provide years of worry free operation, with minimal maintenance requirements.